This week I went looking for a book to help me answer some of my questions about the keys on my maple tree. 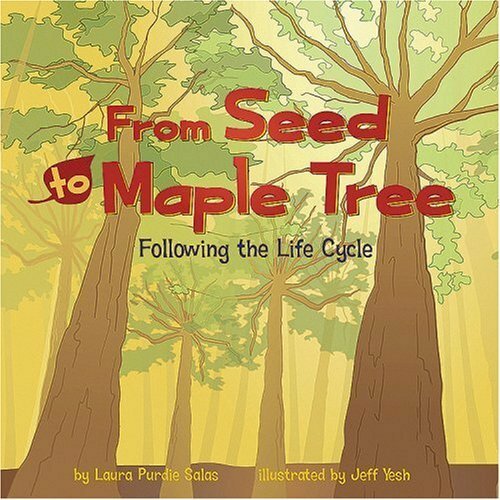 I found From Seed to Maple Tree by Laura Purdie Salas, which is one book in a series of books for kids on different life cycles, including From Seed to Apple Tree , From Seed to Pine Tree , From Caterpillar to Butterfly, and From Tadpole to Frog . I found the book in our local library. 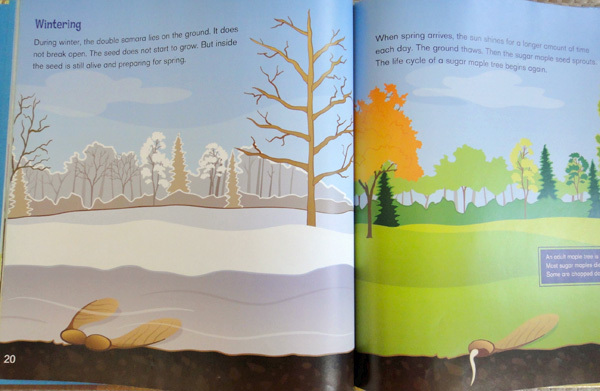 It's one of a dozen or so kids books that explain the basics of how trees develop. I found the pictures most appealing in this book. Jeff Yesh is the illustrator for the entire the Life Cycle series and his pictures are big and bright, filling the whole page with color. Salas begins by telling us that trees have life cycles too just like the animals. Every tree starts as a seed. 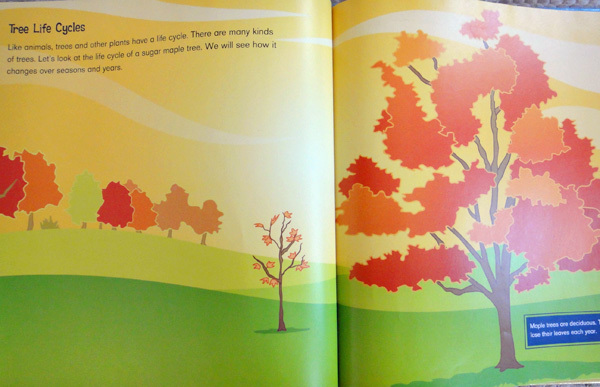 From Salas's description, it seems that the sugar maple is a monoecious tree, which means that one tree will have both male and female flowers. In fact, one flower may have both male and female parts. (After doing a little research, I found out that the Norway maple is like the ash tree and can be either monoecious or dioecious.) 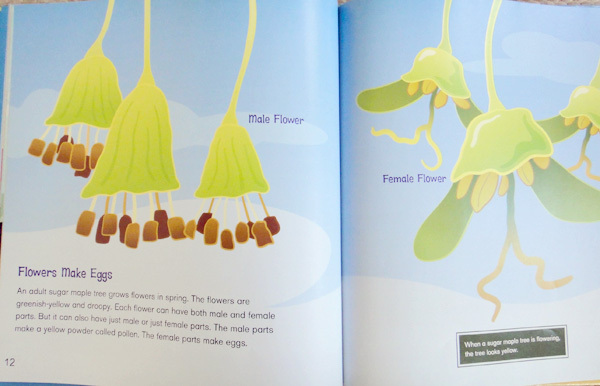 However the boy and girl flowers are arranged, pollen from the male parts is brought over to the female parts, with a little help from the birds and the bees, and you get fruit! 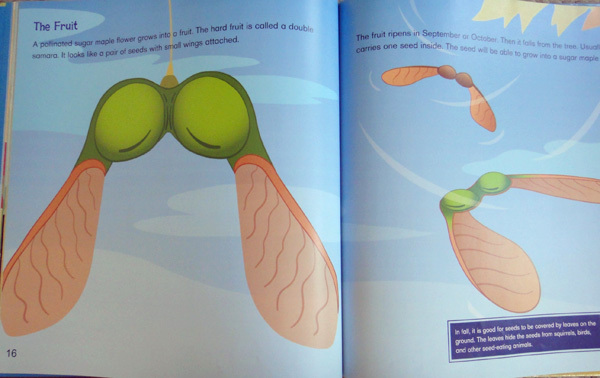 The book confirms that these little winged helicopter thingies are indeed the fruit of the maple tree. 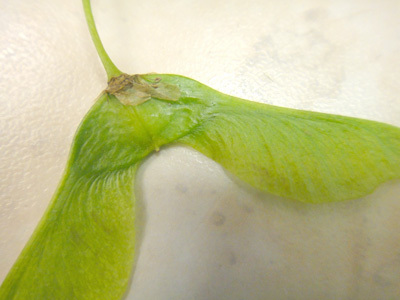 In the sugar maple, you can really see the two seeds in the large green section of the samara. The Norway maple fruit is a little different. It's all green and, as we discovered a couple of weeks ago, has a wider wingspan. Here's a picture one of the hundreds that have recently fallen off of the tree in front of my house. Salas explains that the maple fruit ripens on the tree and should fall from the tree in the fall. This makes me think that the samaras falling from all the Norway maples around me aren't ripe yet. Someone should tell them that, because they are everywhere! Apparently, the seeds need to hide in the fallen leaves to keep from being eaten by squirrels and birds. 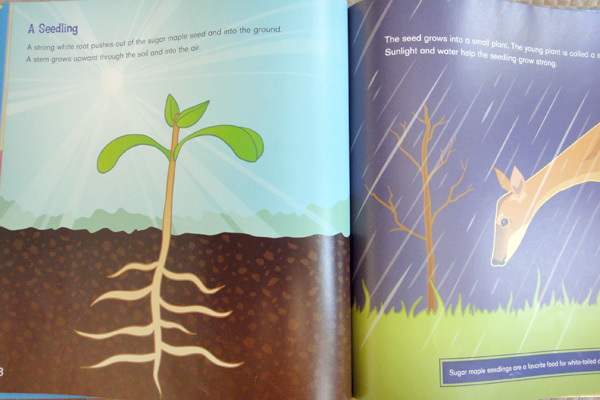 The book also explains that the seed has a better chance of developing into a new tree when it flies away from the parent tree. It seems to me that most seeds just fall straight down and so I've often wondered why there aren't just a million little baby trees under each mature tree. It turns out that the parent tree is using up all the nutrients in the soil right there, so the seed needs to travel somewhere else to find a place with enough water and food to grow. And then the cycle can begin again. This page contains a single entry by Alison published on May 21, 2011 8:07 PM. just how many of these are in there? was the previous entry in this blog. a springtime walk among the trees is the next entry in this blog.